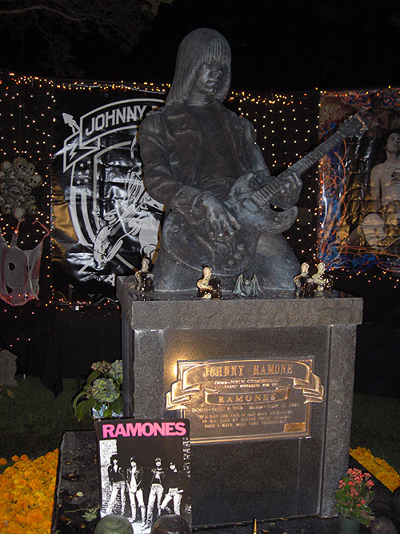 One of L.A.’s most awesome landmarks is the Hollywood Forever cemetery, home to famous dead residents like Mel Blanc, Cecil B. DeMille, Douglas Fairbanks, John Huston, Jayne Mansfield, Bugsy Siegel, Alfalfa from “The Little Rascals,” Rudolph Valentino, and Phil Spector murder victim Lana Clarkson, as well as late, great Ramones Johnny and Dee Dee. Along with its annual Day Of The Dead festival, outdoor drive-in-movie-style cult-flick screenings, absinthe tastings, and DJ nights, the graveyard has also started hosting concerts inside its lushly appointed indoor mausoleum. It’s definitely one of the coolest spots in Los Angeles to see a show. 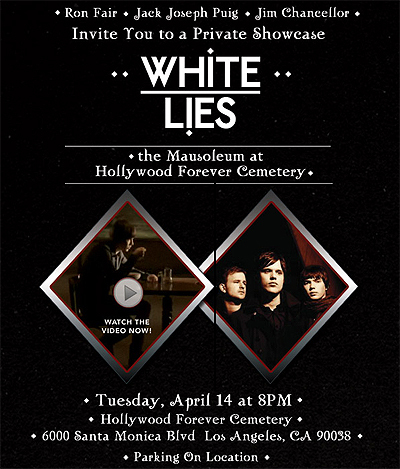 So last night White Lies played a private pre-Coachella set on Hollywood Forever’s hallowed grounds, and the crimson-walled crypt proved to be the perfect environment for the perpetually black-clad and gloom-mongering Brit rockers (probably more so than when they play before sundown in the sweltering desert heat this Coachella weekend).